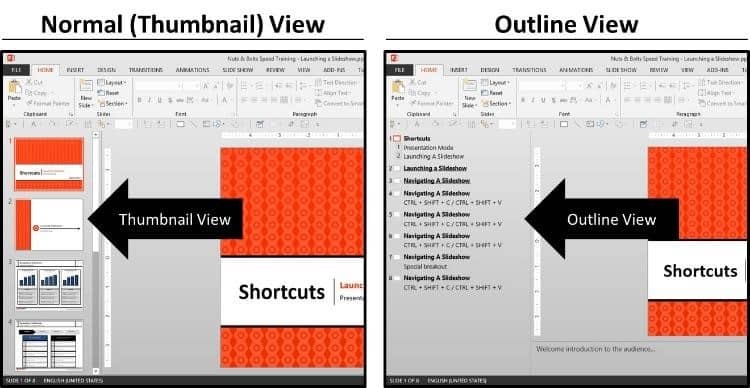 This ultimate guide to the Outline View will take you from beginning PowerPoint user to advanced PowerPoint user in no time! What is the Outline View in PowerPoint? It’s simply a way to view your presentation based solely on the text found within the content placeholders of your slides. For example, you can see the difference between the views in the SAME deck below – the one on the left is the Normal View (thumbnail view), the one on the right in the Outline View. And beyond simply showing the outline of your presentation, there are a number of tricks, shortcuts and PowerPoint hacks to BEND the Outline View to do your beck and calling. You can slowly scroll down the page and soak up all of this PowerPoint goodness, or use the table of contents on the left to jump around to some of the advanced topics. This shortcut opens and/or closes the outline view, displaying either the normal thumbnail view of your slides or the outline view of your content. Notice how in the outline view (see pictured above), instead of seeing the thumbnail preview of the slides (with the respective graphics) you only see the text that is in the content placeholders. And this makes a BIG difference! The text you type into normal shapes and text boxes will NEVER show up in the Outline View, only the text that is the content placeholders that are set on the Slide Master. PowerPoint Outline View not showing text? Only text that is typed into Content Placeholders will show up in the Outline view. 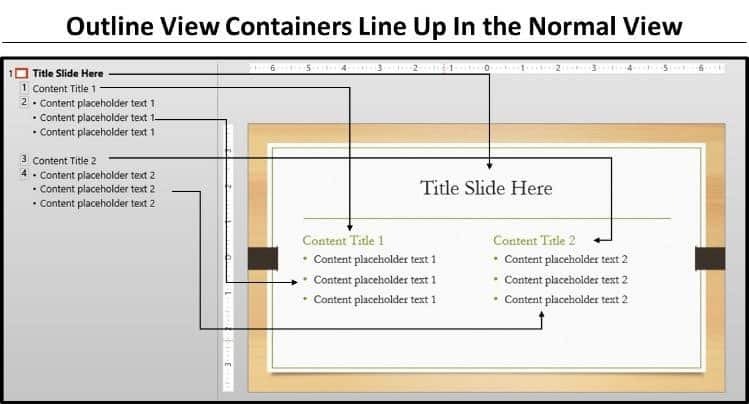 Content placeholders are objects that you (or someone) set on the slide master of your presentation. These are objects like titles, subtitles and any other ‘type to add text here’ type of objects. These types of placeholders can only be set on the Slide Master, and it’s only the text typed within these placeholders that shows up in the Outline View of your presentation. So if you move to the Outline View (CTRL + SHIFT + TAB) and don’t see your slide’s text there, it means that your text is not in a content placeholder, it’s likely in a normal shape or textbox that has been added to your presentation. All of the other normal shapes and text boxes that you add to your presentation in the normal view, WILL NOT show up in the outline view of your presentation (no matter what you do). This is your one stop shop for jumping between your content containers (regardless of how many you have) either in the Outline View or the Normal View of your presentation. In the picture below you can see the different numbers in the Outline View on the left and follow the arrows to the right to see how they line up with the content containers on the right. CTRL + ENTER allows you to jump between these containers without taking your hands off of the keyboard. This shortcuts works both in the Normal View of your presentation, jumping between content containers, and the Outline View. Once you run out of content placeholders to type text into, hitting CTRL + ENTER again gives you a new blank slide to work with. See the video below to see the different keyboard shortcuts in action. When using the Outline View shortcuts, remember that for most of them to work (like collapse groups ALT + SHIFT + 1 and expand groups ALT + SHIFT + 9) you need to rotate to the Outline View to activate it. To rotate (or activate) the Outline View is to first open the outline view (CTRL + SHIFT + TAB) and then rotate active panes counterclockwise (SHIFT + F6). If you are brand new to shortcuts, my advice is to just first start with the open/close Outline View shortcut (CTRL + SHIFT + TAB). If you are an intermediate to advanced user and will be frequently using this view, then it’s worthwhile learning how to activate and navigate this view entirely from your keyboard. 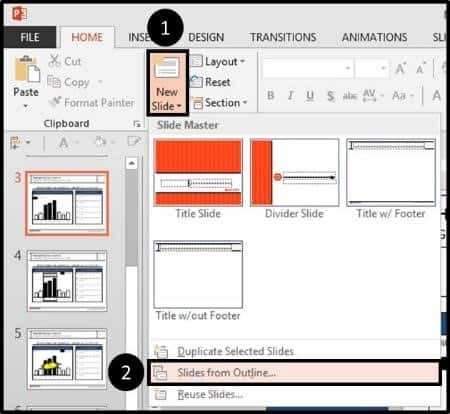 An advanced PowerPoint trick involving the Outline View is learning how to quickly turn a list of bullet points into PowerPoint slides. Note: Just remember when using the outline view in this way, you want to make sure to paste your bullet points as ‘text only’, so that your text takes on the formatting set by your content placeholders instead of maintaining the original text formatting from when you copied it. 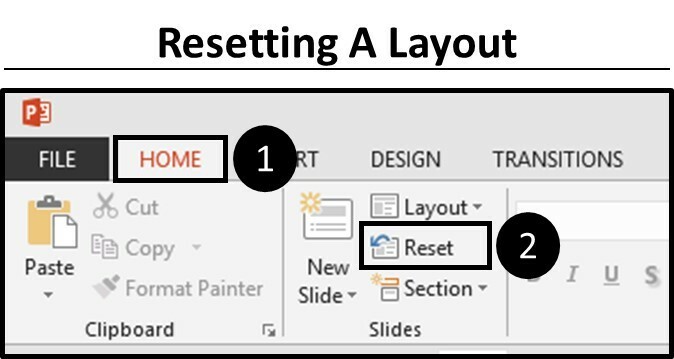 If for whatever reason you forget to paste your content as Text, you can always reset your slide (either in the Normal View or Outline View) to refresh your default formatting. It forces all of your content placeholders back into their original position, defined by their position on your Slide Master (this is useful if something accidentally gets moved out of place). It forces all of your text back to its original text formatting, as defined by the Slide Master and Theme. Another overlooked feature of the Outline View is that you can print it. This is useful when you have a large presentation and you simply want to see what it looks like based on the Titles, sub-titles and other content placeholders….basically your slides minus all of your graphics, pictures, etc. To print your outline view, simply follow these steps. On your keyboard, hit CTRL+P to open up the print options for your presentation. 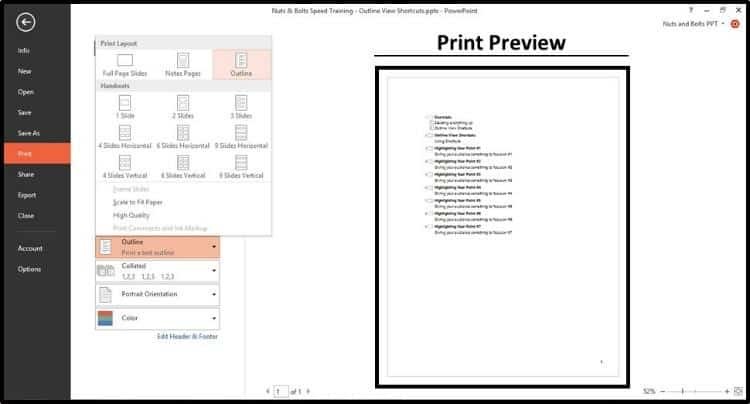 Within the print options, select the ‘Full Page Slides’ dropdown (the default setting) and within the menu in the upper right-hand corner, select the Outline View. Once the outline view is selected, you’ll see a print preview of your slides on the far right. As shown in the picture above, by default the Outline View is a default blank layout, but you can customize this as I will show you in the next section. 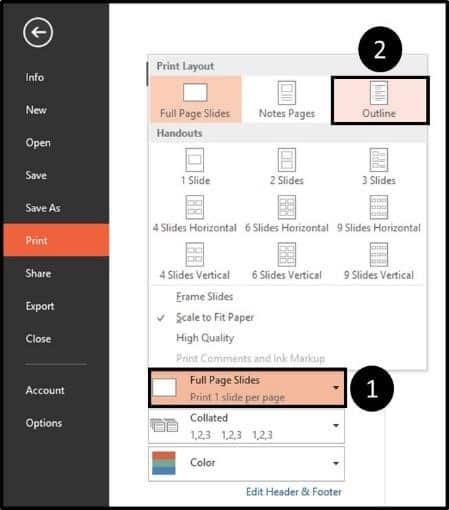 For additional help printing your PowerPoint slides, notes and handouts, see How to Print PowerPoint with Notes (Ultimate Guide). 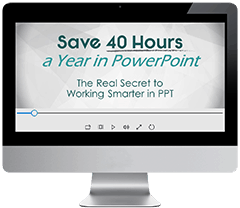 To learn how to convert your presentation outline into the PDF file format, see Convert PowerPoint to PDF. If you frequently print the Outline View of your presentation, you can customize it with your own personalized branding (colors, logos, etc.). This is particularly useful if you plan on sending the print out of the Outline View around. To customize your Outline View, follow these steps. From the view tab, select the handout master icon. Holding the SHIFT key on your keyboard, click the slide sorter command at the bottom of your screen. This SHIFT + Slide Sorter shortcut is a hidden shortcut. To see other hidden PowerPoint shortcuts, see our article on 120+ PowerPoint shortcuts. 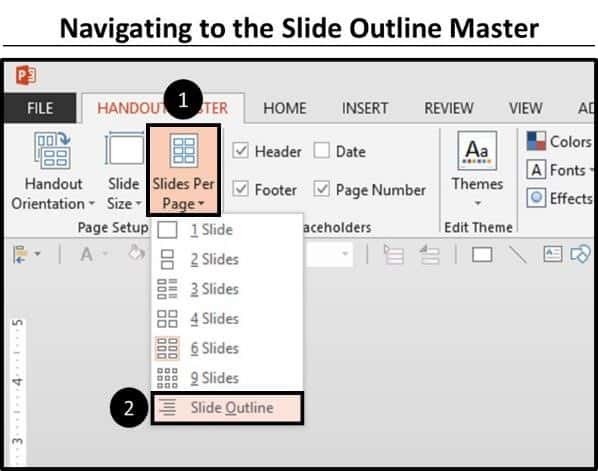 Within the Handout Master view, open up the slides per page drop-down. So this is where you can select the different formats of your slides when printing them as handouts, depending on how many slides you plan to print per handout. These options line up directly (plus some like the Notes Page) with the handout print options available as showing in the picture below. Within the drop down, simply select the Outline View at the bottom to open up the Outline View format. 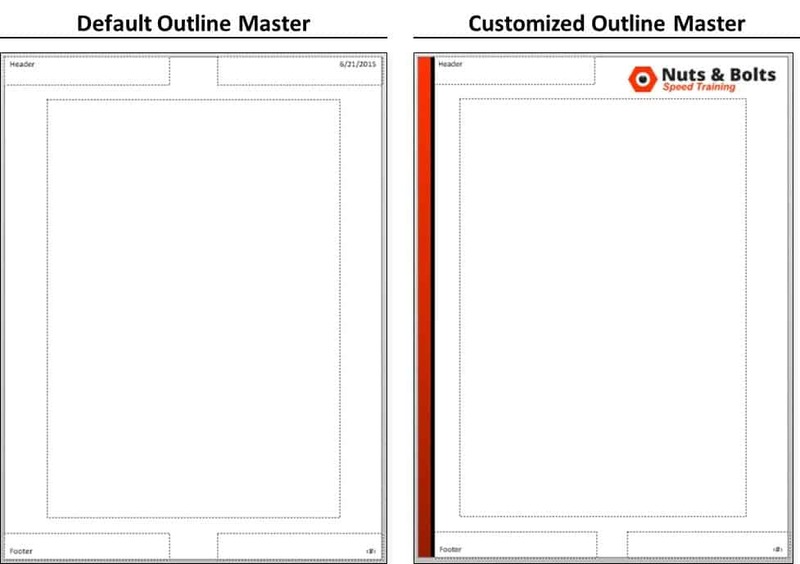 Just like working with any normal slide, in this Handout Master Outline view, you can add your own personal customizations like your logo, design elements, extra text, etc. In the example below I’ve added the Nuts & Bolt log in the upper right-hand corner and a simply gradient colored rectangle down the left-side of the page. You don’t have to do anything too fancy…a little effort will go a long way and shock most people. If you are using a Mac, you need to use the Rich Text file Format (.rtf). See instructions for how to do this on Microsoft’s website here. Importing your slides like this will add any new slides to the current presentation you are working in. Don’t worry, none of your other slides will be effected. 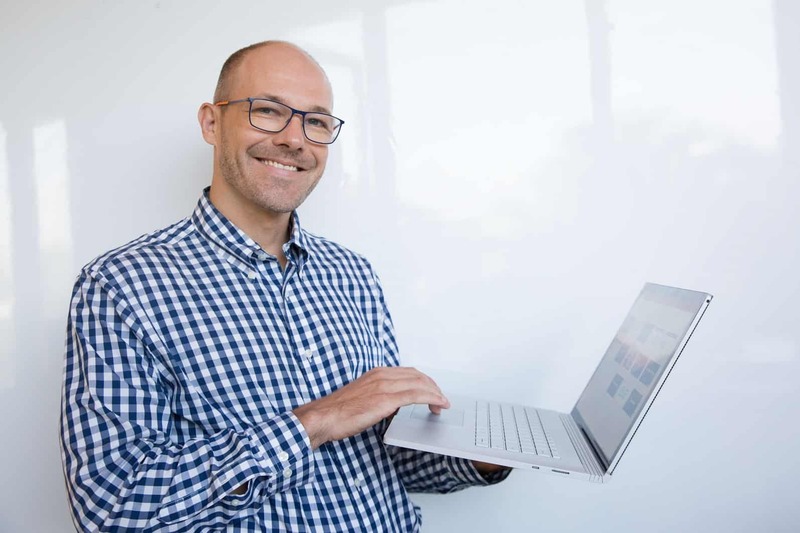 To learn about the common mistakes that happen when converting Word to PowerPoint, see Convert Word to PowerPoint (5 Common Mistakes). 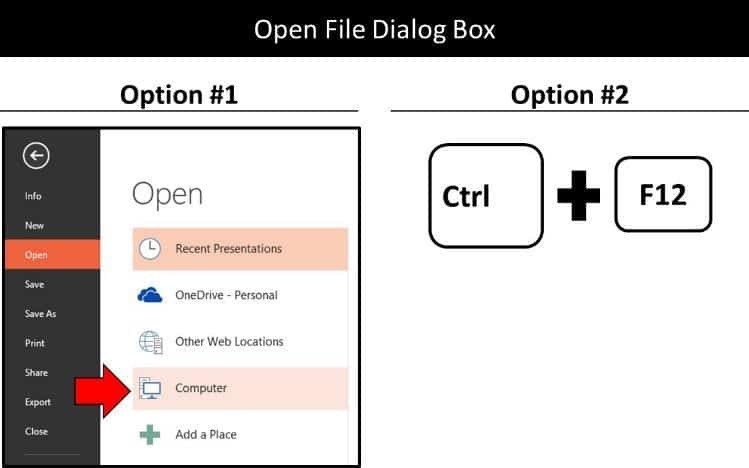 ​From within your presentation, navigate to the Home tab, open up the New Slide dropdown and at the bottom of the dialog select ‘Slides from outline…’ to open up the File Navigation dialog box. ​Within the dialog box, find your Word document and select ‘Insert’. If your outline is formatted correctly, your text will import correctly in the title and content container placeholders. If not formatted correctly, each line of text from your outline will import as its own individual slide. To fix this, you need to use the Title style and Heading 1 styles in Word. Importing an outline like this is a great way to jump start your presentation building process, but don’t stop here. Your outline will always import in the most DEFAULT blank presentation style with only the Title and Content container slide layout. This default look DOES NOT make for an effective presentation, so you will want to make sure to apply a theme and work on incorporating visuals like charts, tables, pictures, etc. to make your presentation more effective. 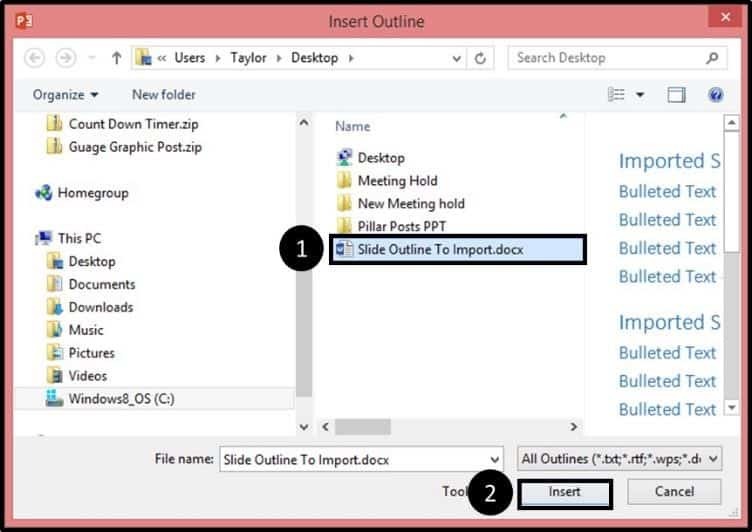 Instead of importing your outline, you can open your outline directly in PowerPoint to start a brand new presentation. To do so, follow these simple steps. 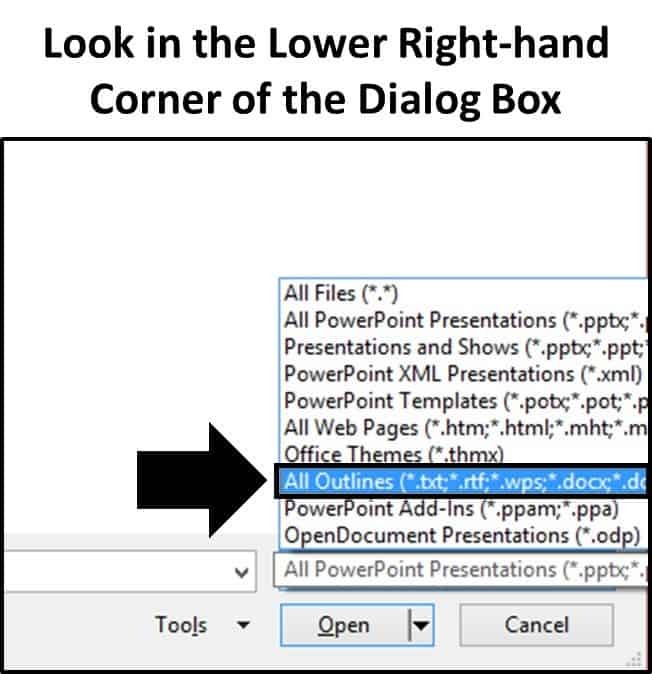 ​Within PowerPoint, either navigate to the File tab, Open and select Computer or on your keyboard simply hit CTRL + F12. Using either method, the navigation dialog box opens up. ​Within the open file dialog box, in the lower right-hand corner change the file type you are searching for from PowerPoint files to Outlines. ​Find your outline document (I usually just save mine in Word) and click okay. Note, if you are using a Mac, you need to save your Word document in the Rich Text File (.rtf) format. ​To fix this, you need to use the Title style and Heading 1 styles in Word.